What should be your next step after knowing what skills are urgently needed? Well, if I were you I will hurriedly enroll in an IT institute to learn such tech skills. So must you. Furthermore, the below mentioned technical skills are in high demand at present in 2019. You can prepare yourself to study these demanded skills after you write your final exams. I mean after you 12th final exams and after your college final exams of the year. Specifically, I know you need some fun and entertainment during the holidays after the exam. But the classes for these courses are only for 2 to 3 hours every day. You can choose to study even at timings and days comfortable for you. Here are the list of top technology skills in demand and job roles for 2019. Companies and businesses are opting for full automation to make their work easier. Artificial intelligence makes machines think intelligently like you. Therefore, it is one among the top technology skills in demand for 2019. On the other hand, Machine Learning is an application of AI. ML helps the computers know how to use data to make a decision or execute a task. Skills needed to build deep learning models for AI solutions to exhibit human-like behavior. Average AL and ML salary in India is INR 568,000 per annum. India is to see a 60% rise in the hiring percentage of AI/ML jobs in the coming years. Instead of just front end and back end developers enterprises are looking for full stack developers. Working with customers and other business requirements. Furthermore, there is a 20% growth in the demand for full stack developers in India. Significantly, the average salary of a Full Stack Developer in India is INR 6.25 lakhs per annum. Furthermore, full stack development is one among the leading top technology skills in demand for 2019. This is most lucrative among the top technology skills in demand for 2019. Significantly, data science tech professionals are in greater demand globally. In this course you will learn how to collect, collate and interpret data (big data). This will help you to understand your customer and business dynamics better. Moreover, as a Data Scientist in the IT field, you will learn INR 620,244 per year. Significantly, Economic Times reports that there has been a 400% increase in the demand for data science professionals. You can expect about 5 billion smartphone users in the world in 2019. Correspondingly, this signifies that mobile apps will be in greater demand. And of course one among the top technology skills in demand for 2019. The average salary of a mobile applications developer is INR 462,500. Moreover, it is predicted that the mobile app market is set for a 385% growth rate through 2021. IoT signifies everything that is connected to the internet. Moreover, it will be useful if you learn this skill that is one among the top technology skills in demand. IoT is made up of things that are connected to each other. Eventually, produce a fleshed-out idea that’s ready to prototype. It is predicted that there will be 1.4 million new jobs in IoT by 2027. Furthermore, the median salary of IoT professionals in India is Rs. 15.2 lakh compared to Rs. 8.65 lakh per annum in IT sector. DevOps is a combination of cultural philosophies, practices, and tools. Its primary goal is to shorten the development life cycle. Therefore, This enables organizations to deliver applications and services faster. Consequently, DevOps is important among the top technology skills in demand. As a DevOps engineer, you should have a passion for coding and script. DevOps will face a talent vacuum in 2019. And you can gain the skills to fill the skills gap. As a DevOps Engineer your average salary per year will be INR 625, 135. 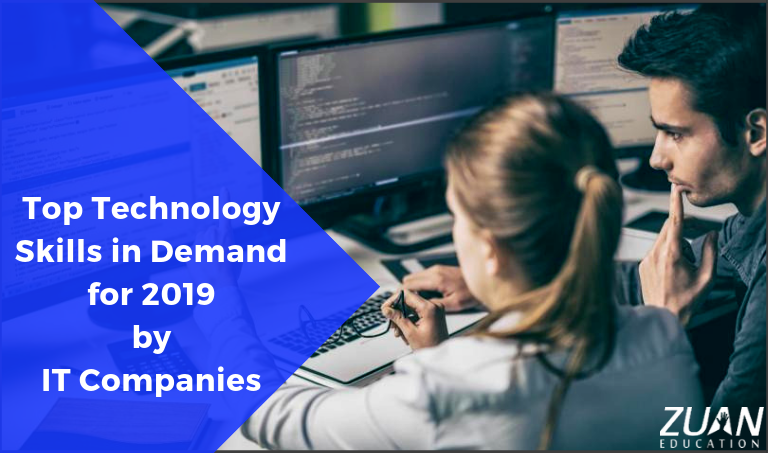 This is another top technology skills in demand for the year 2019 in IT companies. Moreover, cloud computing is a knowledge associated with this field. Furthermore, as a cloud engineer, you will develop, plan, design, install, manage and maintain and support IT cloud systems. Significantly, you will work with cloud developers like Amazon Web Services, Open Stack or Azure. Research suggests that employer interest for candidates with cloud computing skills has risen to 33%. It is also an industry which is poised to become a $300 billion business by 2021. As a cloud engineer at the entry level you will get an average salary of INR 12-19 lakhs per annum. As a business intelligence analyst you have to understand your organization’s unique data needs and covey them to stakeholders. Furthermore, this is one among the top technology skills in demand in 2019 as businesses pivot from harvesting to making sense of data. Significantly, as a business intelligence analyst you will earn INR 630K – 727K. As a young graduate learning the above skills will guarantee you a highly paid salary. And a well-settled life. Moreover, there is a need for many software engineers for several software developments. Significantly, take time to develop any one of these skills and evolve with the tech world.